First and foremost, you need a quality 9×13 baking dish. I liked my cast iron pan because it bakes beautifully and looks nice for your brunch tablescape. 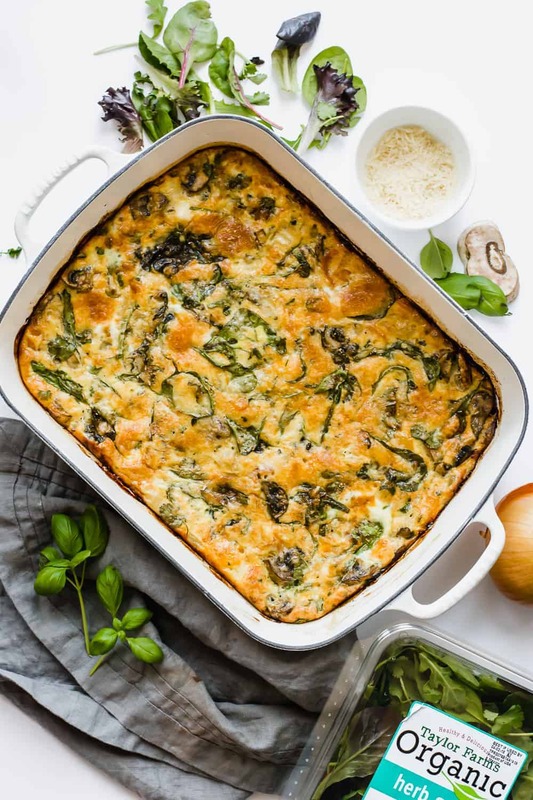 No frittata dish is complete without some beautiful leafy greens, so make sure you have quality power greens. 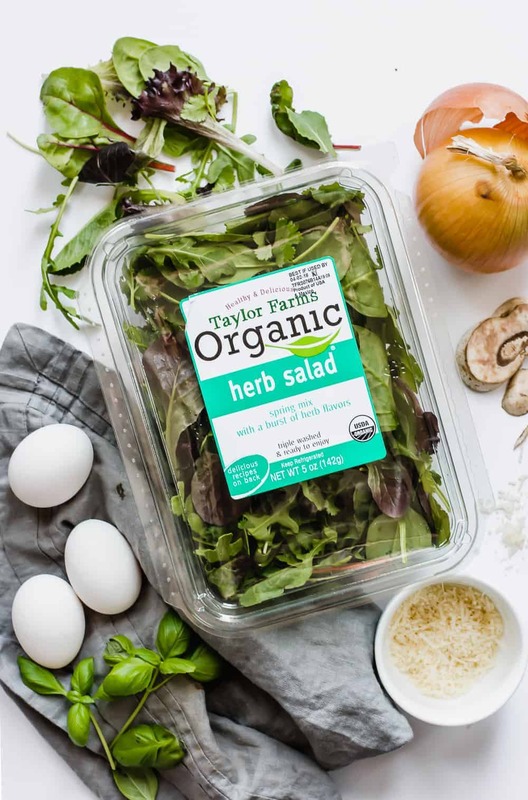 I love the Organic Baby Herb Salad blend from Taylor Farms. You can buy them here using their store locator. It has a good mix of spinach, lettuces, chard, arugula, and herbs like cilantro, parsley, and dill. Takes all the guesswork out of which greens to buy and chop up! (And it saves you time.) 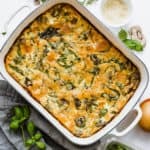 Your frittata looks really pretty with all of the color, and adding greens is a great way to make it a healthy brunch dish that is full of vitamins and nutrients. Make sure you buy a dozen eggs for this recipe! It calls for all 12, and you want to have enough for other items too. Three words: herbs, parmesan, salt. 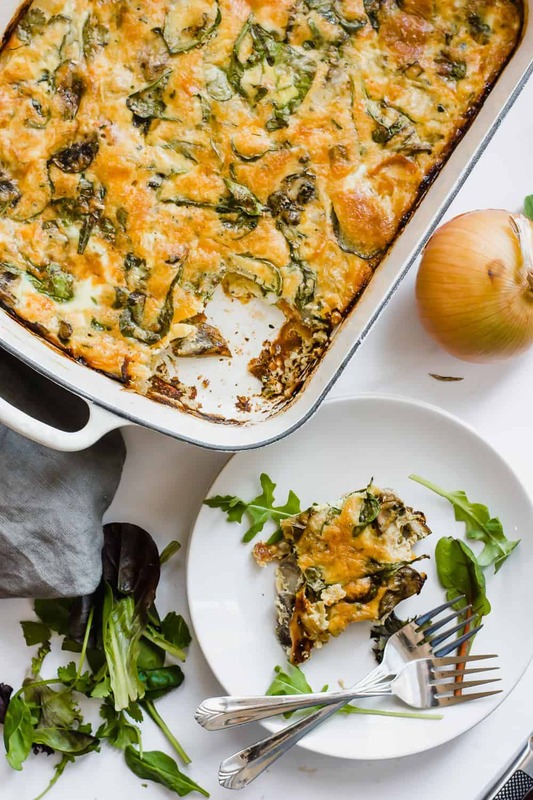 If you don’t have these, your frittata will be bland, so don’t skimp on this part! Like I mentioned, the Taylor Farms Organic. Herb Salad has some good herbs included in their mix, but you MUST use fresh basil and fresh parmesan cheese in this recipe. TRUST ME. 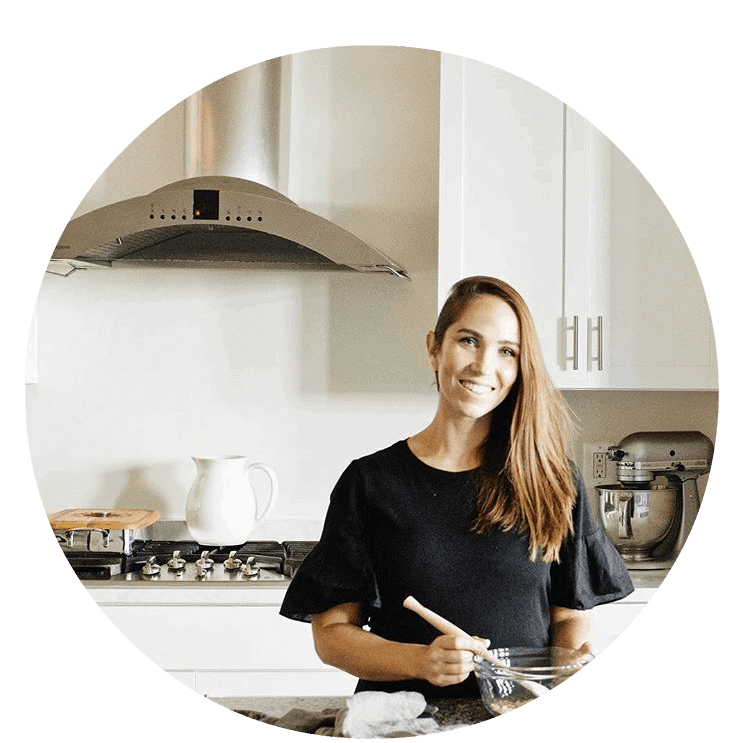 These are all the most common problems people run into when making this spectacular egg dish. But with this recipe, you won’t have that issue! Baking it in a 9×13 baking dish for 50 minutes, and letting it set for 10-15 minutes will give you the perfect, fool-proof consistency every time. 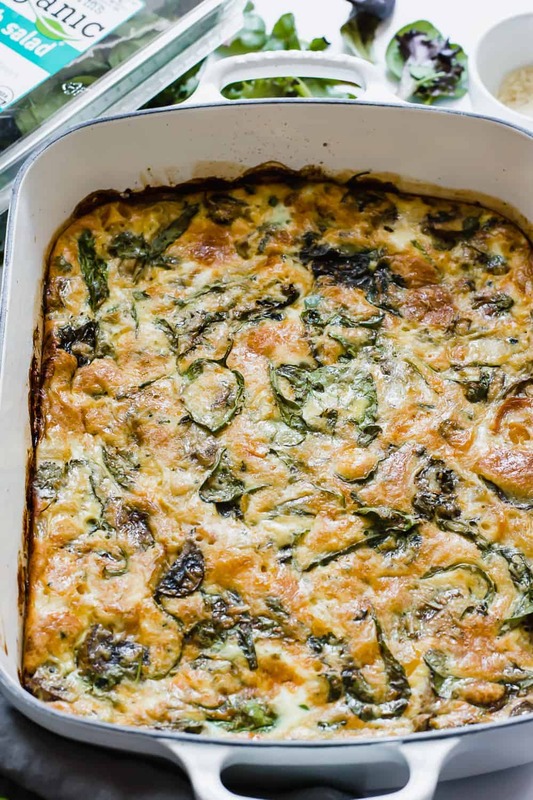 Make this easy baked frittata recipe with spinach in a 9x13 dish. It's the perfect breakfast or brunch for a crowd, that can be made in under one hour, and is also gluten-free! In a skillet, add avocado oil and onions. Cook on medium high heat until fragrant. Add in peppers, tomato, mushrooms, and green onions. Cook until tender, about 5-8 minutes. Add in garlic and cook another minute. Set aside. In a large mixing bowl, whisk together eggs until pale yellow and fluffy. Mix in heavy cream, cheese, basil, salt, and pepper. Stir in mixed greens. Pour vegetable mixture into a greased 9x13 baking dish. Pour egg mixture on top. Stir together until evenly spread in dish. Sprinkle with Parmesan cheese. Bake on 350°F for 50 minutes. Remove from oven and let rest for 10-15 minutes. Serve while warm and enjoy! Bake it in a heavy 9x13 baking dish. This ensures even heat distribution and best results. Bake until internal temp is at least 160 degrees F, which is the recommended time for eggs. On my oven, this is at least 50 minutes (depending on your altitude and oven). Let it set for 10-15 minutes. THIS IS IMPORTANT! Need some more breakfast inspo? Check out these easy breakfast and brunch recipes. This post is sponsored by Taylor Farms, a product I love and recommend!